Virbac is delighted to announce the addition of Hexarinse® For Horses to the Virbac Equine range. In response to the demand of UK equine vets specialising in dentistry, Virbac has introduced Hexarinse® For Horses to their equine range in the UK. 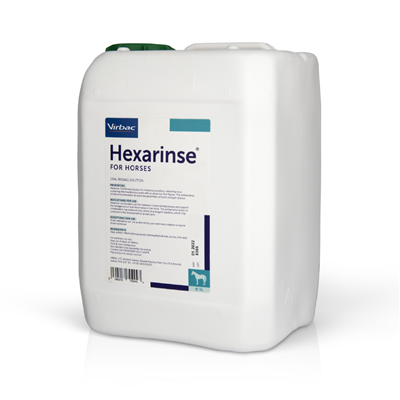 Hexarinse® For Horses is an oral rinsing solution prepared specifically for horses that contains dilute chlorhexidine gluconate with an attractive mint flavour and does not require reconstitution. Hexarinse® for Horses is a convenient ready to use formulation which enables accurate administration, specially formulated with an attractive mint flavour to enhance acceptance to horses. The multi-use 5 litre container provides a practical volume for use in horses. The antibacterial action of chlorhexidine supports the maintenance of oral health after dental procedures and may aid the management of periodontal disease, oral inflammation and peripheral caries. Tel: 01359 243243 Email: enquiries@virbac.co.uk.